First, what is Pokémon Go? 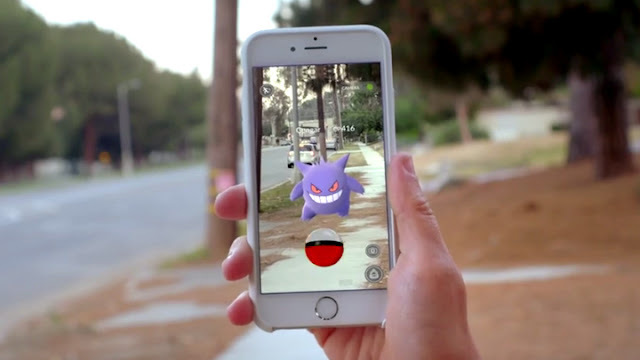 Pokémon Go is a free-to-play location-based augmented reality mobile game that works on both Apple and Android devices (smart phones and tablets). The game uses real world exploration to collect Pokémon in the game, and later to battle Pokémon against each other. Note - The game has become intensely popular, as the Pokémon Go craze has swept the USA and Canada. For some people it is now more popular than Facebook. It isn't just for kids either. Many adults, usually between 20 to 40, are now playing the game. But that doesn't mean that elderly people cannot get into it too, and are doing so - partially for the fitness benefits. The goal of the game is to physically get the player to go from location to location, collecting Pokéballs, Pokémon, and other objects within the game. This means that people are walking, jogging, running, cycling, etc to get from location to location as part of the goals of playing the game. Pokéstops are real world locations, varying from park benches dedicated to people, statues, museums, art galleries, historic sites, etc. At each Pokéstop a person visits they can then slide the icon sideways so it spins and they then get free Pokéballs and other stuff that are useful for playing the game. Pokégyms are unlike real gyms, in the sense that you don't normally fight people at gyms. When you visit one you can try to defeat the current defender(s) of the gym which works a bit like the old "King of the Castle" game you might have played when you were a kid. You fight your strongest Pokémon against whichever Pokémon are guarding the gym. If you manage to defeat all of the Pokémon guarding a gym, then you capture that gym and you can leave a Pokémon there to guard it. You will get your Pokémon back after they are later eventually defeated. So why is Pokémon Go good for Fitness? This game has been surprisingly good at getting people outside exercising when they would normally be indoors watching TV or fooling around on the internet. It is arguably a Competitive Sport. The more you exercise, the more Pokémon you get, the more powerful those Pokémon become, the better they do in battles, etc. Thus it is a surprisingly powerful and easy way to motivate people to go outside and exercise. That motivation factor is one of the biggest reasons why some people succeed at losing weight and others fail in their attempt. A game which helps motivate people to go for walks outdoors certainly scores points on the motivation factor, even if it does seem childish. Now it is possible to gain various things within the game, like Pokéballs, just by paying for them. However even if you pay for the Pokéballs you still need to go outside and walk around to find and catch Pokémon - as they are rarely going to be on your doorstep. Thus while some people might choose to spend money in an effort to reduce how much exercise they have to do to play the game, they still need to exercise a fair bit just to find Pokémon. Furthermore you cannot cheat during this game. While it is possible to catch a few Pokémon while in a car or on a bus, most of the time the speed of the vehicle will cause you to miss things, such as Pokémon and Pokéstops that are too far away by the time GPS catches up to the speed of the vehicle you are in. Thus the ideal speeds to be going is somewhere between walking and bicycling. What I find fascinating is that this game has done what no sport has done before - get millions of people to suddenly go outside and exercise, with little more motivation than the attempt to find fictional non-existent pocket monsters who only exist within the game. 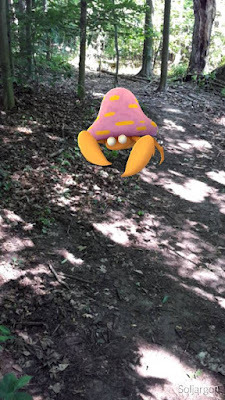 You don't really get much out of the game beyond the fun of catching them, and the journey of catching them becomes the really fun part instead - in other words, walking around and exploring becomes the real challenge and the whole point of the game. The journey becomes both the means and the end goal. 1. Family Fitness - Take the whole family with you and you can all play the game together as you explore. Friends who are also into the game means more people to talk to while you explore, so it becomes a social activity for everyone involved. 3. Cycling - Get there even faster on a bicycle. See more Pokéstops and catch more Pokémon in less time. Many bicycle trails will also have various Pokéstops along the way too. 4. Walking - Take the easy way and just walk it. Very relaxing. 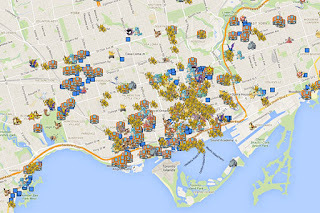 In Toronto a simple walk around the downtown area will garner you quite a few Pokémon. See map on right. 5. Hiking - Hilly parklands can sometimes have lots of Pokémon. In the last two days I have visited two parks in Toronto and came away feeling invigorated from walking and exploring, and catching quite a few Pokémon. 6. Focus on Cardio - Don't be afraid to alter your speed now and then. Rotate between walking and jogging between Pokéstops the same way people do using HIIT (high intensity interval training). This way you get to enjoy the best of both worlds between walking and jogging, getting more Pokémon faster, but with breaks that allow you to take it easy once in awhile. 7. Stay Safe - Don't take silly risks. Pay attention to where you are going, what is around you, avoid cliffs or steep ledges, take the long way around, avoid dangerous shortcuts, and take your time. Also you don't need to look at your phone the whole time. You can ignore it while you walk from location to location. 8. Go to the Beach - If you want to swim, then do it safely. All of the Pokémon will be on the shore however as they usually dot places of importance, historical or otherwise. 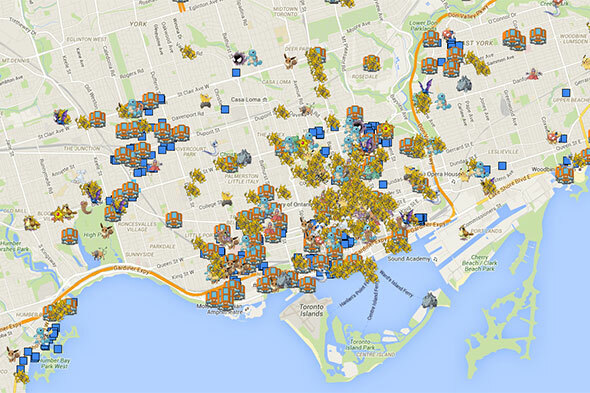 Many water-based Pokémon can be found near lakes, rivers, and ponds - and Toronto has plenty of rivers and water features to check out. 9. Rollerblading - Again, watch where you are going and be careful. Rollerblading will let you get from place to place faster, which saves on battery life - and you get to capture more Pokémon faster. 10. Skateboarding - Not for everyone, but still a decently fun way to get around Toronto. 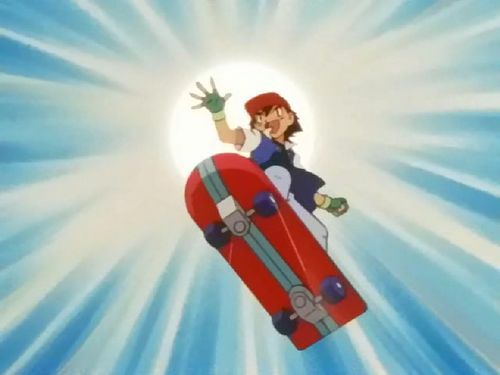 Note - Fans of the Pokémon TV show will also note that one of the main characters also used a skateboard frequently to get around.